The Incorporation of Wrights possesses a complete record of its transactions for upwards of a century. 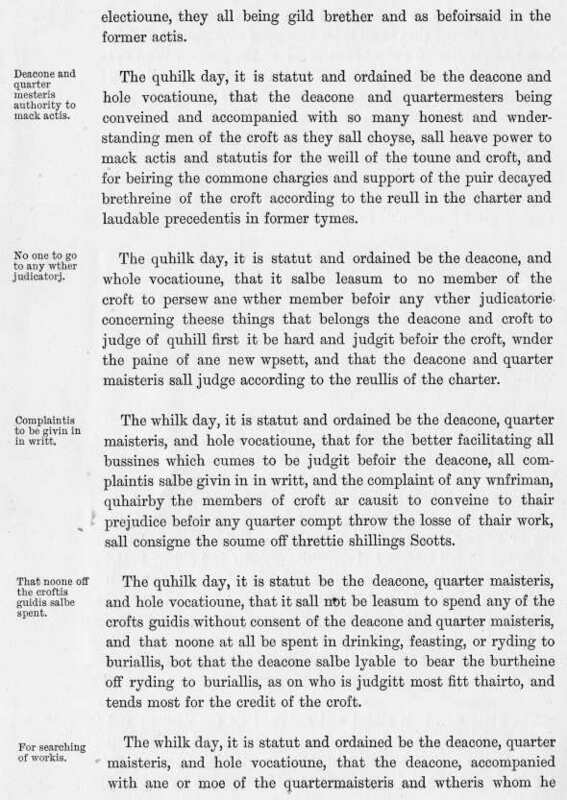 This consists of (1) six volumes of the Minutes of the Meetings of the Master Court, beginning in 1781; and (2) three volumes of the Minutes of the General Meetings of the Trade from 1782. For the period prior to 1781 the only Minute Books extant are three small volumes. 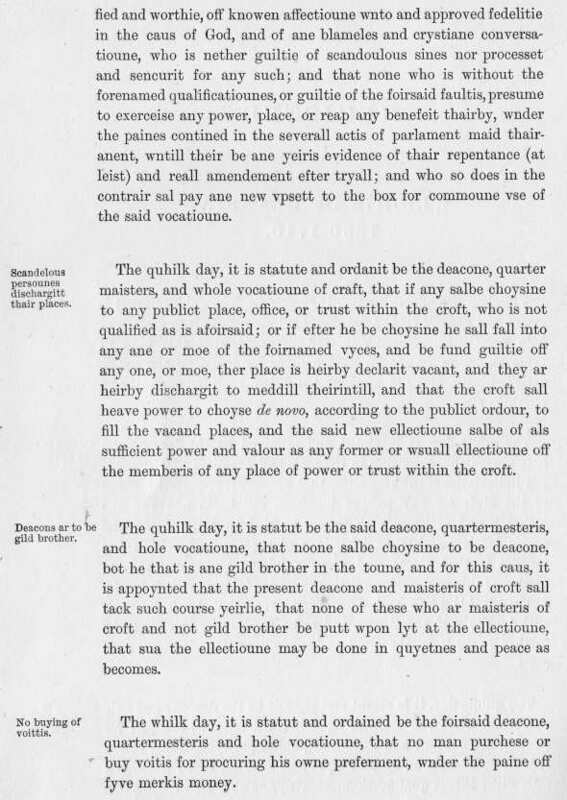 The first, which is declared to be a Register of the Acts of the Incorporation, extends from 1650 to 1710, the second from 1696 to 1780, and the third from 1755 to 1773. The first of these and part of the second are written in a seventeenth century hand, legible only to an expert. 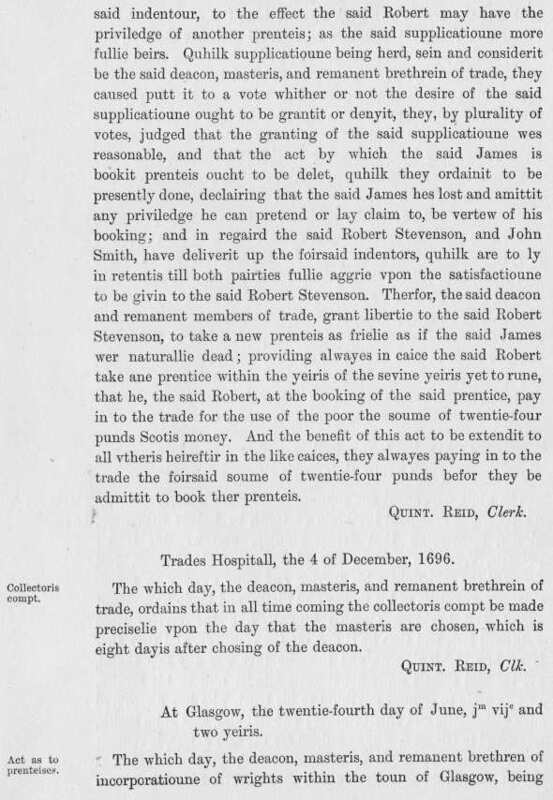 Unable myself to read them, I submitted them to my friend, Mr. Robert Renwick, Depute-Town Clerk of Glasgow, who had them transcribed for me. 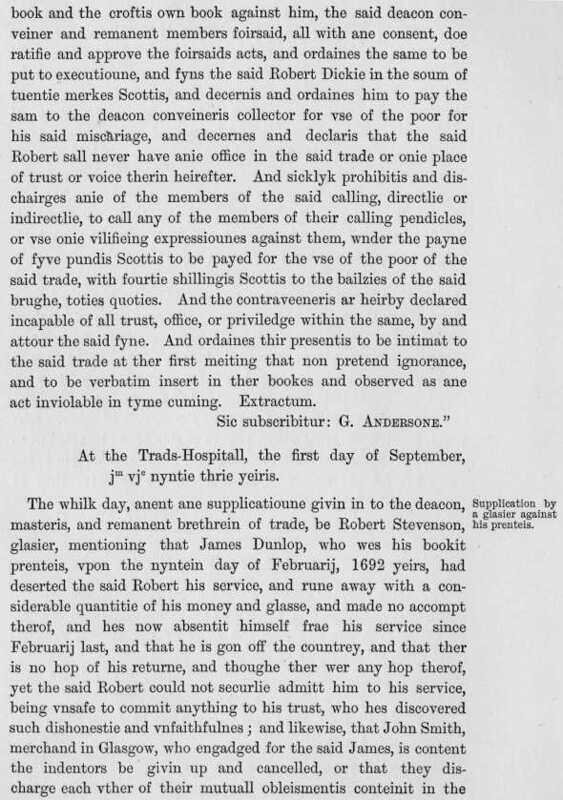 The greater portion of his transcription is now, by the kindness of Deacon Watt, presented to the members in the following pages. 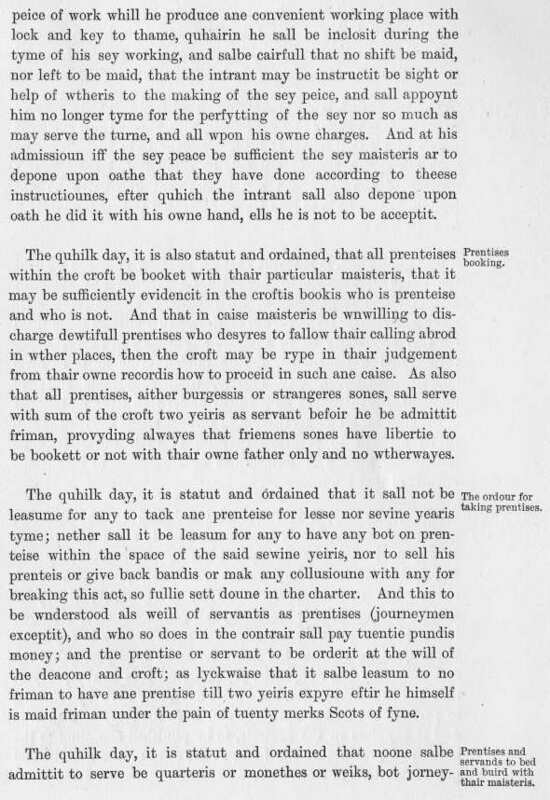 The whole of the first volume, or Register of the Acts of the Incorporation, has been printed. 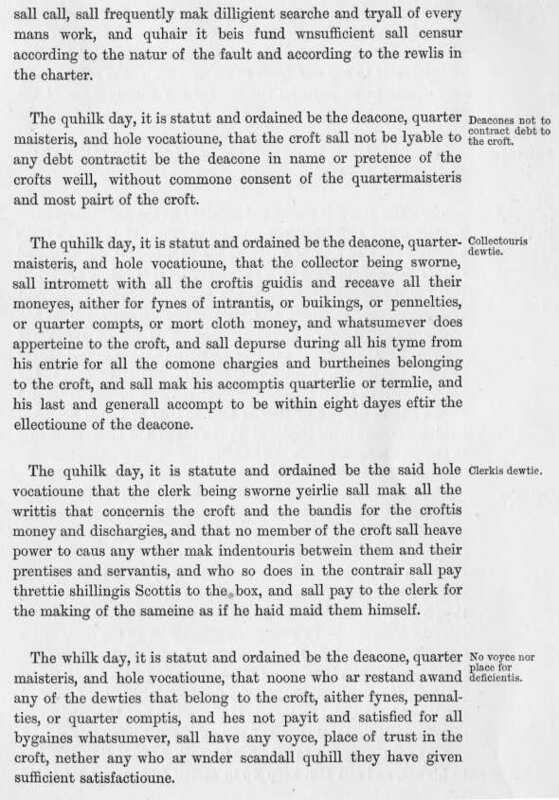 It begins with a Minute dated 22nd February, 1650. This was in the year of the Declaration of the Solemn League and Covenant, and the Minute bears the stamp of the Covenant upon it. All meetings are appointed to be opened and closed with prayer; and no one, it is declared, can be Deacon who is not "of known affection unto and approved fidelity in the cause of God," or free of "scandalous sins." 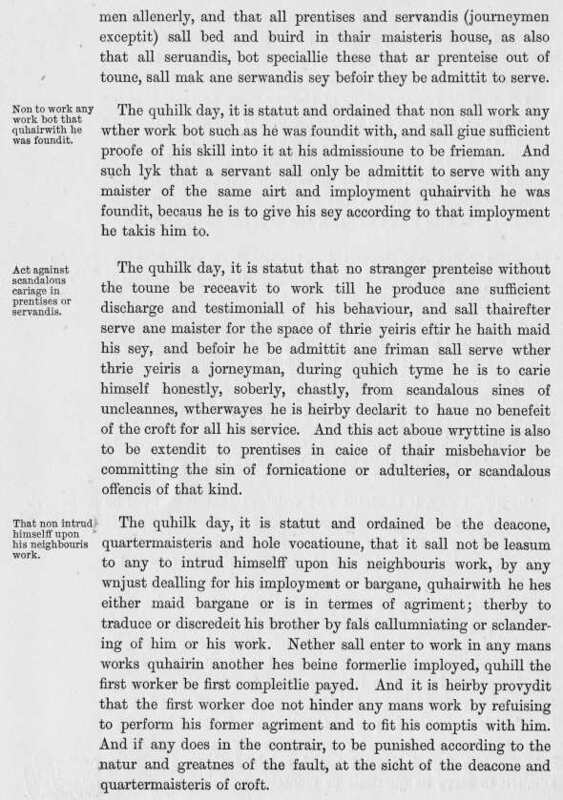 I am bound to acknowledge that the one part of this regulation has fallen into abeyance, but I have never heard it asserted that the Deacons of to-day do not attain to the high standard of morality prescribed for them two centuries ago. 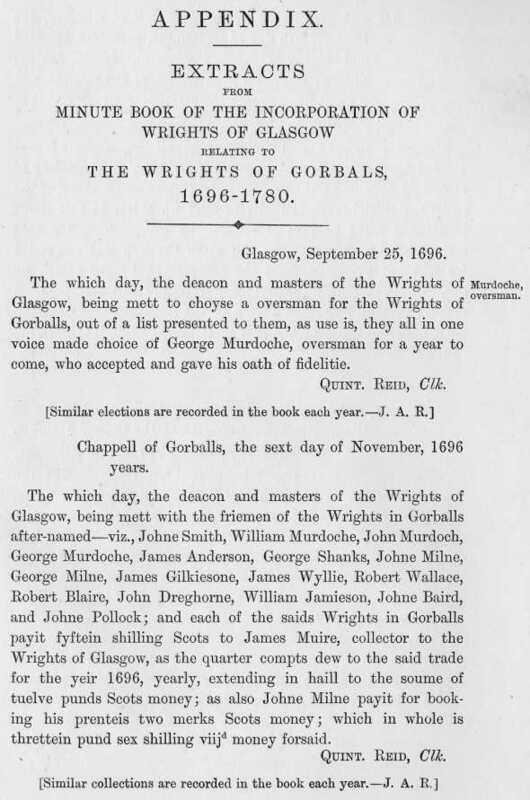 As an Appendix, a few excerpts have been added from the second volume, which relates exclusively to meetings held under an Agreement between the Incorporation and the Wrights of Gorbals. 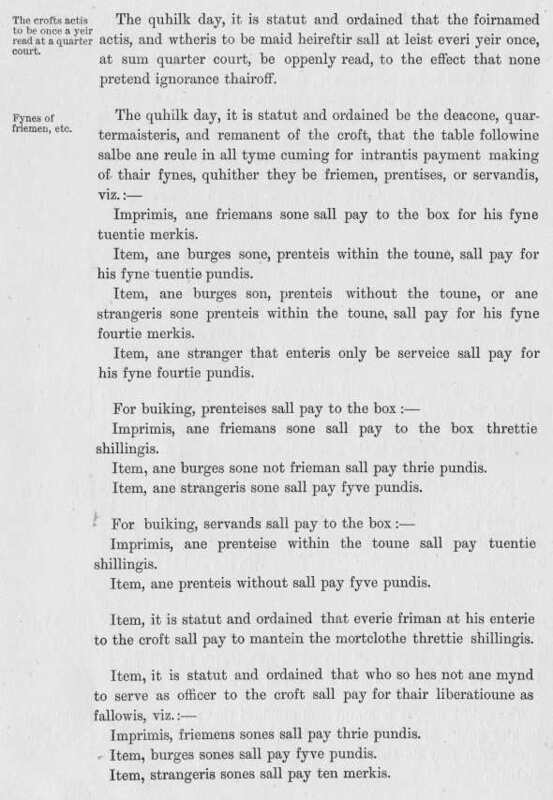 There is not even a copy of this Agreement among the papers of the Incorporation; and Mr. Renwick can find no trace of it in the Burgh Records. 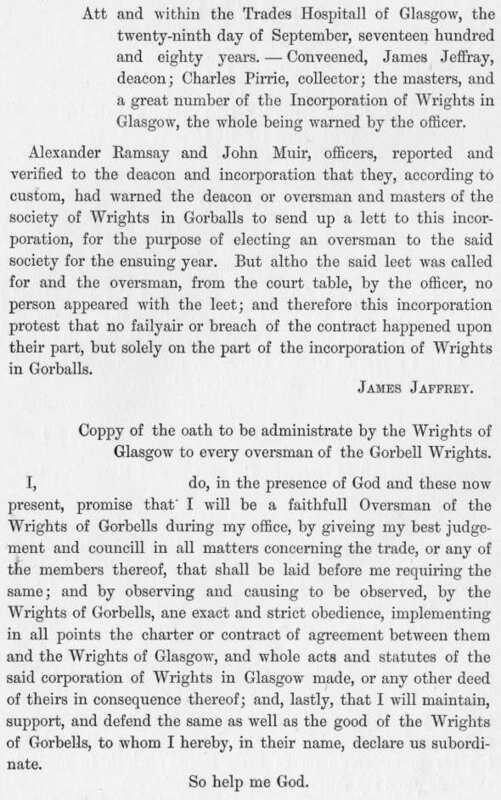 But, no doubt, it was of the same nature as the Agreements which are known to have existed between some of the other Trade Incorporations of Glasgow and their fellow-craftsmen in the outlying suburbs, and would fix the terms upon which the Wrights of Gorbals were allowed to exercise their craft within the Royal Burgh of Glasgow. 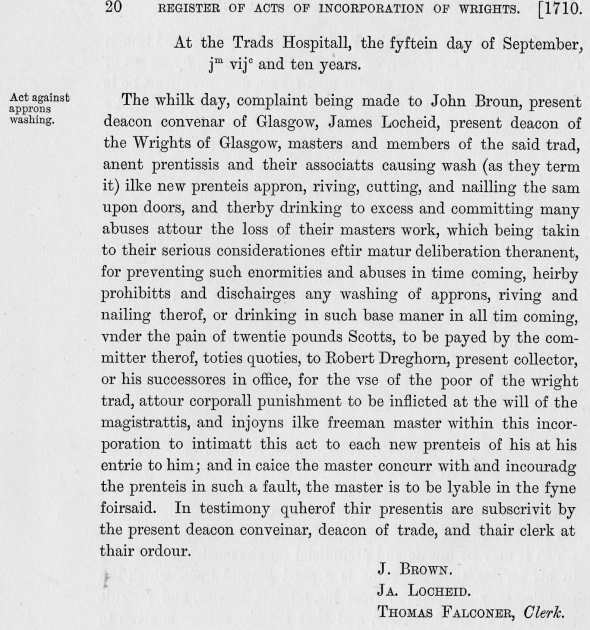 Whatever its nature, we find from the last Minute, dated 29th September, 1780, that the Wrights of Gorbals then brought it to an abrupt termination; and there is no evidence in the subsequent Minutes that it was ever, to any extent, renewed. The other Minute Books contain much interesting matter illustrative of the history of the Incorporation and the City generally; and I trust that the present volume is only the forerunner to a complete history of the Incorporation. In conclusion, I should say that Mr. Renwick has added to my obligations to him by revising the proof sheets. In point of fact, he has practically relieved me of all trouble in the matter, and I cannot thank him too much. 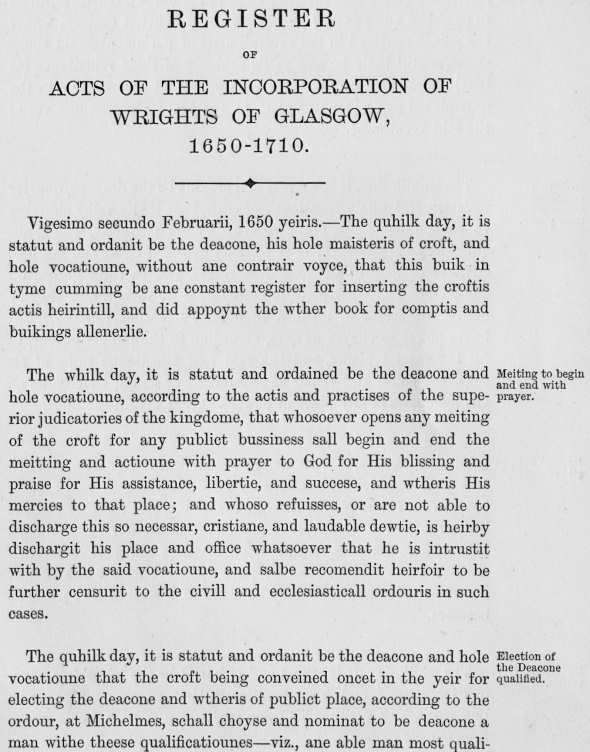 REGISTER ACTS OF THE INCORPORATION OF WRIGHTS OF GLASGOW, WITH APPENDIX. THE Incorporation of Wrights possesses a complete record of its transactions for upwards of a century. This consists of (1) six volumes of the Minutes of the Meetings of the Master Court, beginning in 1781 and (2) three volumes of the Minutes of the General Meetings of the Trade from 1782. For the period prior to 1781 the only Minute Books extant are three small volumes. 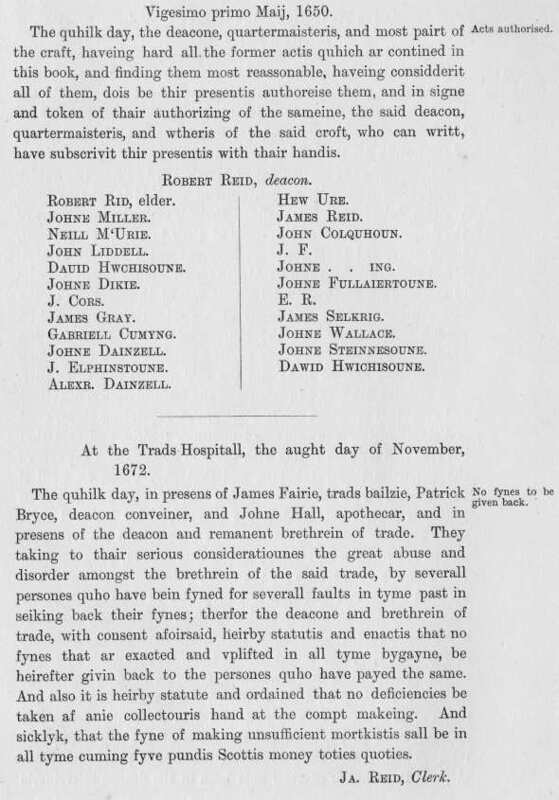 At the Annual Meeting of the Incorporation in 1876, a Committee was appointed to prepare a list of names of all the Members who had entered the Incorporation after the year 1800. 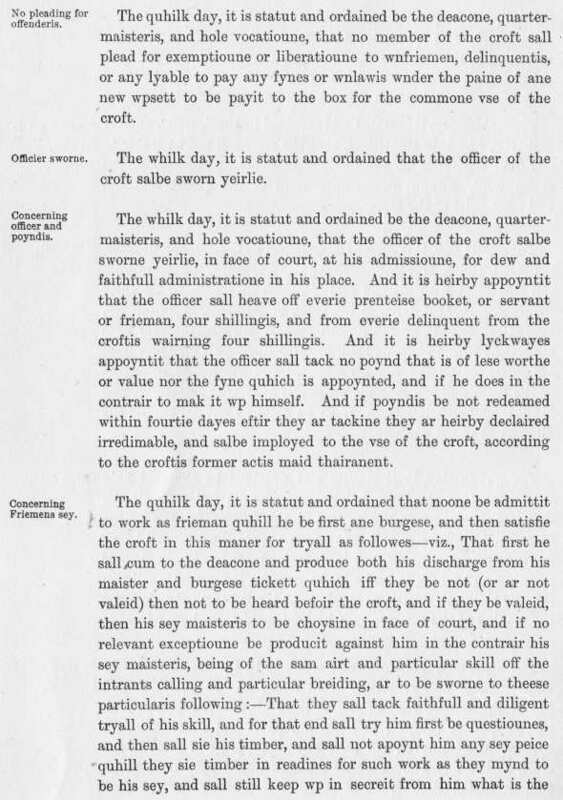 Subsequently, in 1880, it was resolved by the Master Court of the day to print this list as well as the "Seal of Cause" and By-Laws; and the opportunity was taken of including in the print a brief record, under the title of "Historical Memoranda," of the more important events in the history of the Incorporation. 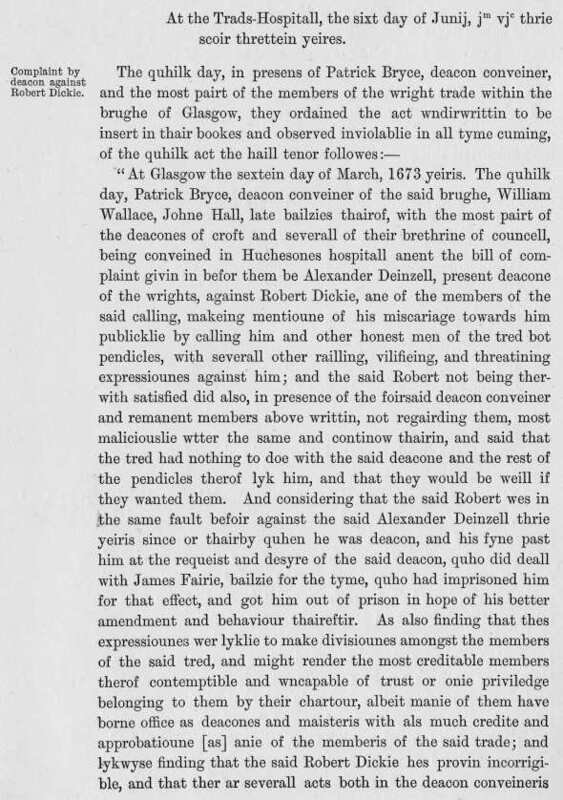 A second edition, bringing dow^n the list of Members to date, was printed in 1883; but this becoming exhausted in 1889, a third edition, with no little assistance from Mr. Robert Renwick, Depute Town-Clerk, Glasgow, was prepared by me, and printed in that year. 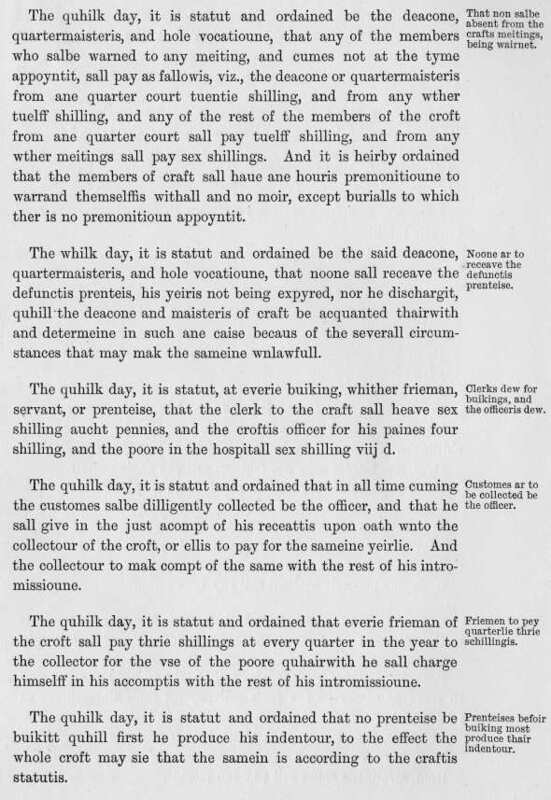 In this the "Historical Memoranda" were re-arranged and amplified; and, in addition to other matter, it contained (1) the Roll of Members as at 16th August, 1889, giving the craft, genealogy of each Member, and (2) a fac-simile of the "Seal of Cause." The third edition has, in its turn, become exhausted, and I now submit to the Members of the Craft a fourth. 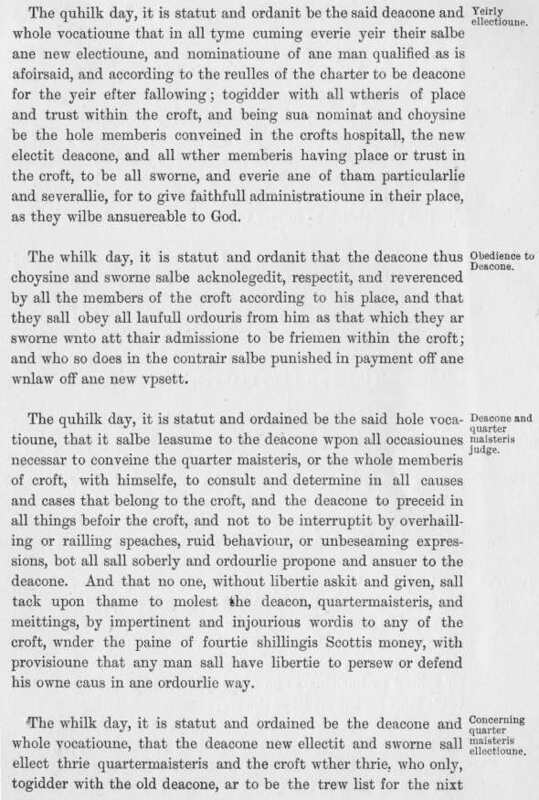 In this the "Historical Memoranda" are brought down to date, and the new By-Laws, which were adopted on 2nd November, 1891, and enacted by the Trades' House of Glasgow on 29th February, 1892, are substituted for those which were enacted in 1849. 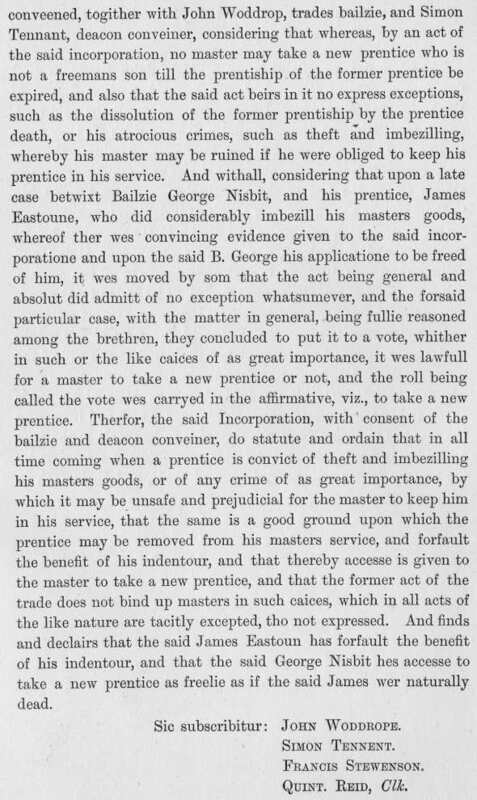 The Genealogical Roll of Members has been brought down to 1st January, 1900, and there has been imported into the "Historical Memoranda" a copy of the scheme for administering "Gardiner's Charity," which was settled by the Court on 16th November, 1893. In other respects this edition is practically a reprint of the last.